Give your garden a touch of classic style. Suitable for both large formal gardens and smaller gardens whey they form a perfect evergreen screen. Perfect for edges, borders and small boundaries - plus these plants are ideal for single topiary specimens. Makes neat hedges to 1m tall over 10 years if required but can be kept at 30cm if needed. These established plants are 3 years old and trimmed several times to give really bushy plants make growing a box hedge easy. Supplied as an established plant in a 9cm pot, ready to be planted straight out. Used for centuries as classic garden hedges, often in formal gardens, but equally at home in small gardens and containers. 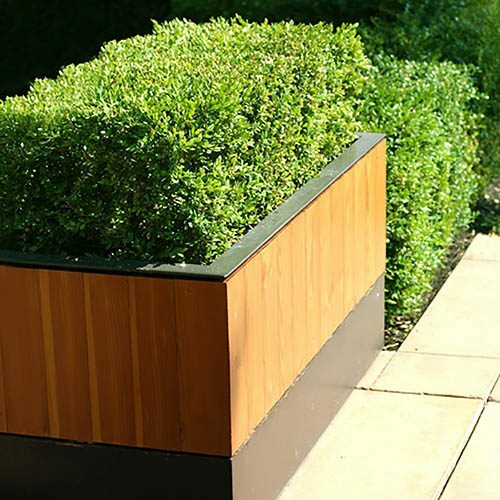 When trimmed, box forms perfectly regimented rows of glossy evergreen bushes that bring classic style to your garden. Box hedging, Buxus sempervirens, is perfect for edges, borders and small boundaries, and makes neat hedges to 1m tall over 10 years if required but can be kept at 30cm if needed. It's shade tolerant and is happy in most soil types as long as it's not waterlogged. Supplied as a pack of 10 plants in 9cm pots, these established plants are 3 years old and trimmed several times to give really bushy plants make growing a box hedge easy. If you don't fancy growing them together as a hedge, you can always pot them up individually into favourite containers and move plants to where you want them, just remembering to keep them well-watered. Plant one plant per 25cm (10') for best results. They will grow 10-15cm per year. Do not trim for 2-3 years after planting, then lightly tip in summer as needed. Always water plants from below and keep to the most open spacing as possible (don't crowd them), to keep plants healthy. Box should also be kept out of direct, hot sunshine, preferring to be planted where it gets at least a little shade during the heat of the day. To plant, water your potted plant well. Place in a row approx. 25cm apart.